Forget everything you know about the food pyramid when it comes to the Paleo diet. This fad diet is purposely devoid of any grains, which makes up a sizeable portion of common food pyramid. 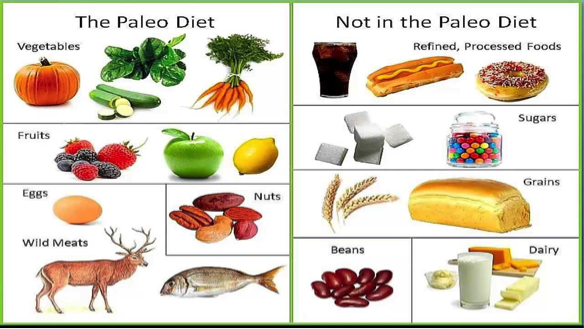 The Paleo diet, also called the “cave man diet”, is based strictly on foods presumably eaten by early humans. The foods that are allowed on this diet are basically comprised of only meat, vegetables, and fruit. No processed food is allowed including milk, yogurt, and cheese. the boon of the agriculture revolution. The tenets of the diet are based on the premise that grains are not essential to the diet and, when over consumed, contribute to obesity. Grains are carbohydrates that are converted into glucose for energy. The glucose that is not used for energy immediately is stored as fat, almost certainly contributing to obesity and type II diabetes. The Paleo diet actually encourages consumption of virtually unlimited meat and vegetables. The upside to such a restricted diet is that you don’t have to worry about meticulously counting calories. Remember that no one diet fits all. Although this diet may be new to many, the idea of a Paleolithic diet dates back to 1975. Walter Voegtlin first described the diet; however, it was made vastly popular at the turn of the century by Dr. Loren Cordain. Since then, many books, recipes, websites and blogs have been developed to help you understand and incorporate the Paleo Diet into daily life—no small feat for the average American. The books that Cordain has written describe in detail all one needs to know about the Paleo diet and the advantages. Celebrities like Grant Hill, Uma Thurman, Jessica Biel, and Megan Fox and Kobe Bryant attribute their tiptop condition to the Paleo lifestyle.